If you want to dress in a shirt that is ideal for the spring and summer months, you will find comfortable and classic short-sleeved shirts from MASCOT. MASCOT offers an assortment of short-sleeved shirts that are suitable for office work, crafts, industry and production, and you will therefore easily find a shirt that fits you. The short-sleeved shirts are produced in different fabric thicknesses. You will find a classic work shirt in a durable material and with a spacious fit but also, for example, light-coloured shirts in oxford weaving and in poplin weaving. The oxford weaving is an incredibly soft and strong weave that gives the shirt a slightly textured structure. 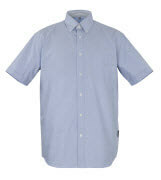 On the other hand, the poplin weave is a tightly woven and smooth shirt fabric. In addition, these shirts are available in both classic and modern fits. The classic fit has extra width and is therefore spacious. The modern fit follows the natural shape of the body and is slimmer. All MASCOT’s short-sleeved shirts have good freedom of movement so you can move freely. You will find MASCOT short-sleeved shirts in the MASCOT® CROSSOVER range. MASCOT® CROSSOVER offers shirts in a variety of colours so you can find a shirt for any job and corporate brand. You can benefit from combining the shirts with another product from MASCOT, for example, a knitted jumper from the same range. The short-sleeved shirts are available in PREMIUM quality, which means that the shirts are produced in materials and with features of top quality. This gives you a shirt that can be used over and over.